A bug in typing completion of mel has been removed. Right-mouse clicking on a partially completed mel command raises a popu menu. 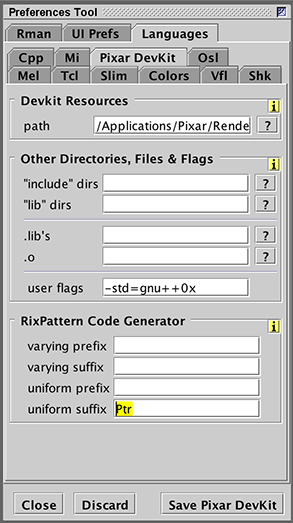 Several improvements have been made to the way that Cutter generates a .cpp file from a RixPattern .args document. To distinguish the difference between the local (pointer) variables that are automatically declared by Cutter in the ComputeOutputParams() method a "Ptr" suffix is appended to the names of pointers that reference a uniform value. For example, a snippet of an .args file is shown below. A .cpp file generated from the .args document would declare the pointers within the ComputeOutputParams() method as follows. While the other pointer, without the suffix, should be treated as an array. // Use the value for this specific shading "point"
Users can specify their preferred prefixes and/or suffixes via the Preferences window. 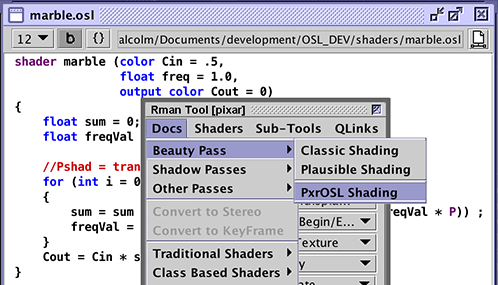 If a compiled OSL shader source code file is open on Cutter's desktop a simple rib file can be generated using the Rman Tool docs menu.